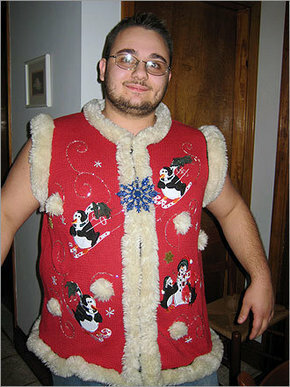 In recent years, ugly Christmas sweaters have become more of a popular theme for holiday parties. Some offices will even host an annual competition with employees showing off their hard-on-the-eyes winter warmers. Here are some of the funniest entries I was able to locate! This gives a whole new meaning to Operation Red Nose! It takes a lot of balls (or in this case ovaries) to wear an outfit likes this. It’s not so much that the top is ugly… just bizarre. I bet that nose becomes quite the target at any party she goes to and I pray she never chooses this wardrobe for going to the clubs… guys on the dance floor are big enough losers without falling all over themselves for stuff like this. If this is what they meant, I don’t want to wish joy to the world! 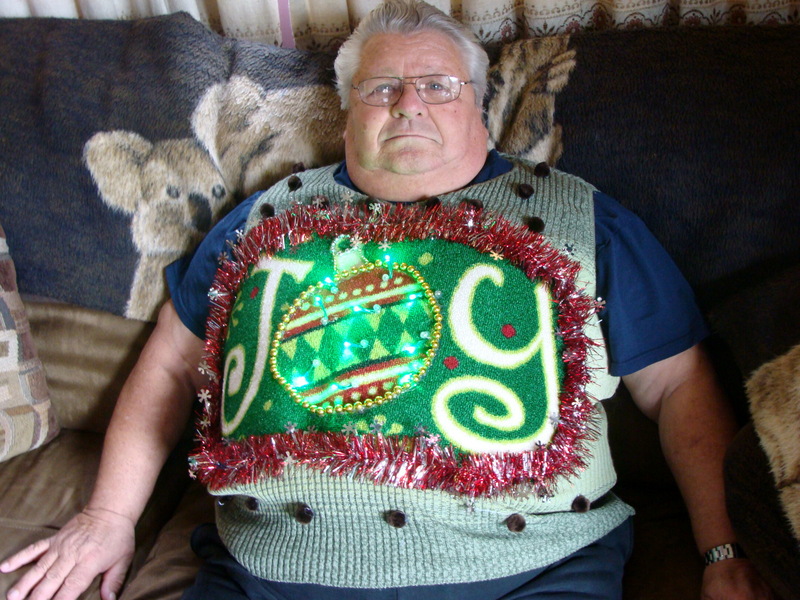 This guy looks incredibly uncomfortable and I’m not sure if that’s because of the sweater or his weight. Perhaps he hasn’t left that couch for ages and he’s still dawning this sweater despite the photo being taken in mid summer. Quit staring and make him some fried chicken. I feel bad for women. When they are depicted as being droopy, it means saggy breasts… but when a dude is just as droopy, it means a massively large member. This guy’s sweater could be misinterpreted as Frosty throwing up in the middle of a keg stand. 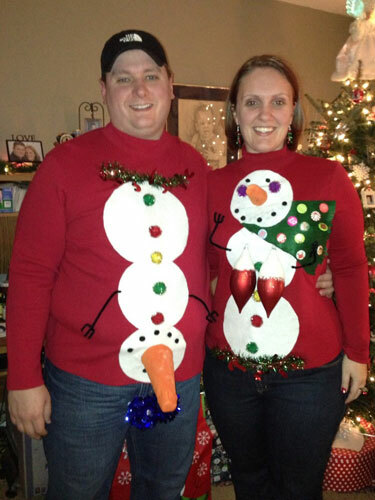 If these two get close together does that put the sweater snowmen in a compromising 69 position? It’s never a good idea to put your face on a shirt… let alone an ugly Christmas sweater. 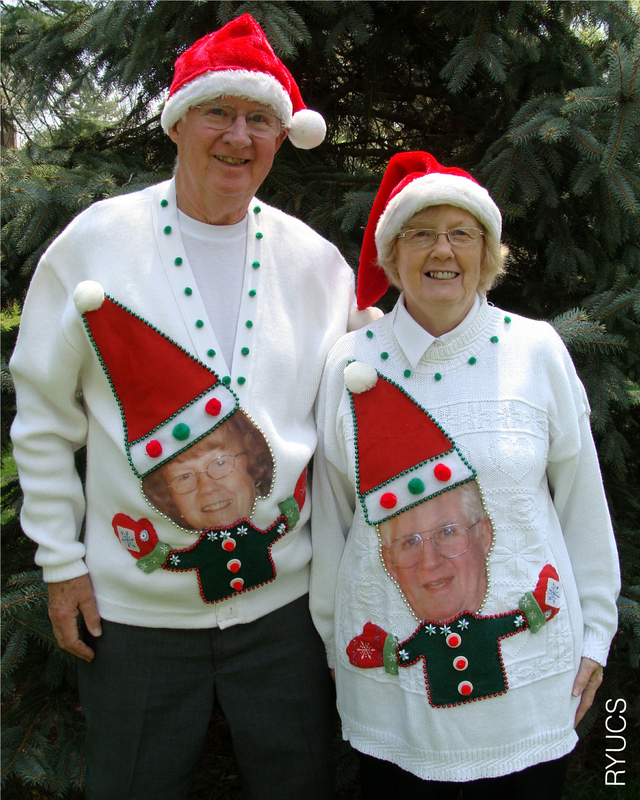 How are either of these octogenarians supposed to cheat on their spouse when they’re wearing each other’s faces!? I find it funny that the woman has the exact same smile in her sweater photo that she’s offering to the camera person here, too. If Mrs. Sip and I ever wear matching clothes, it’s time to consider a separation. I’m not sure I’m a fan of the sleeveless look. No wait, I’m definitely not a fan of the sleeveless look. It’s not very functional either, as the moment you step outside into the frigid air, you’re going to be pretty damn cold! Sure, this guy has a lot of beef on him to help keep him warm, but I just don’t think it would be enough and perhaps that’s all for the best. Always looking for a good laugh, I appreciate all these folk’s self-deprecating efforts. If you know of some even uglier Christmas sweaters, send them the Sip Advisor’s way and give me a good chuckle! My version of the cocktail didn’t turn out as dark as others I have seen online (I should have used a little more Chocolate Syrup), but it tasted decent and really, that’s the most important element of a cocktail. 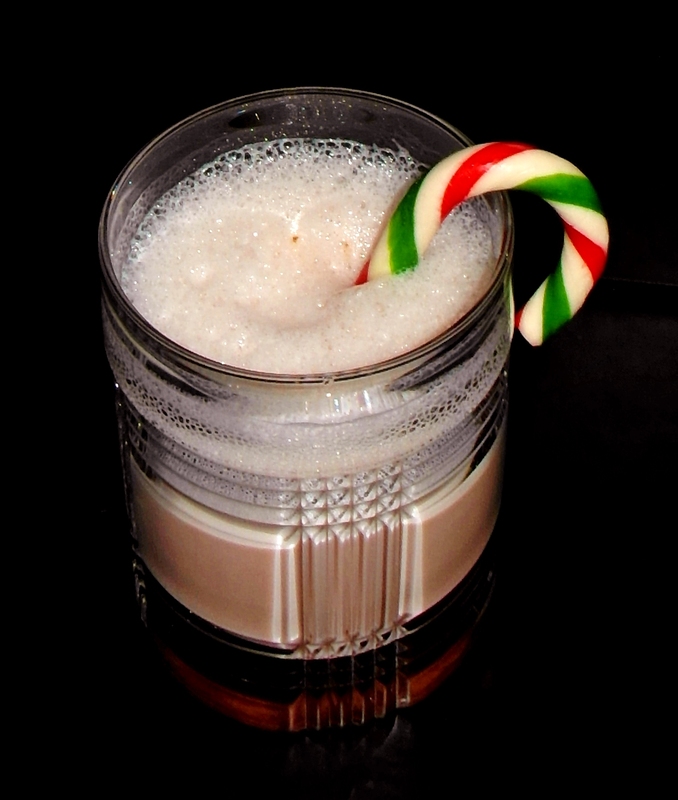 I’ve really enjoyed using all these Candy Canes in the various cocktails presented through the 25 Days of Christmas.